Pictures tell a lot, probably too much for some head teachers in Kibera. They won’t allow anyone to take them in their compound before you explain in detail why you have to take photos, what you intend to do with them and of course how they stand to benefit. Before you pull your digital camera out of your pocket, and press anything, the head teachers, directors, or teachers in charge have a number of questions for you to answer. Forget the journalistic five W and H, theirs probably double or even triple that of journalists. Me, and my colleague Zack met our first questions at Kicoshep School, where the head teacher wondered why a lot of research was being done in Kibera and what the impact of all these research would be. We took her through the details of the project that entailed collecting new data and coming up with a website that will bring together all the educational facilities in Kibera, and how, not only her school, but all the schools in Kibera stood to benefit from the project outcome. She agreed to help fill the form we had, but then she sent us to their headquarters near Wilson airport to get permission to take photos in her school. No shutter was going to be pressed at Shofco School for Girls either. Explanation given was that there are strict rules on photo taking in and around the school. Shutter was pressed at Bethel school, but not until after we had spent two hours trying to convince the head teacher, her deputy and other two teachers who had many questions to ask, including some in vernacular language that none of us could understand. They argued that since we as Map Kibera are the ones who will host the website, Map Kibera stood to benefit more than them, citing past examples where organizations collected data and nothing was ever seen or heard of them again. They were keen to know the most immediate benefit that they’ll see – and fell just short of asking to be paid for the information they were to give. But just when we were giving up on them, they gave in to our request. Otherwise, I was free to slide the exposure of my Canon and turn on my flash sensor where I felt necessary in all other schools, which was both fun and educative in equal measure. Every moment I had my lens focused on a signpost, school compound or classroom, most of which were in a very poor condition, I felt like I was doing something that the Kenyan government had failed in: giving the schools a voice to speak on the challenges they face. For instance, some school directors pointed out that the government is not very keen in improving education within the slum itself, and is only doing so in the schools that are on the outskirts of the slum. 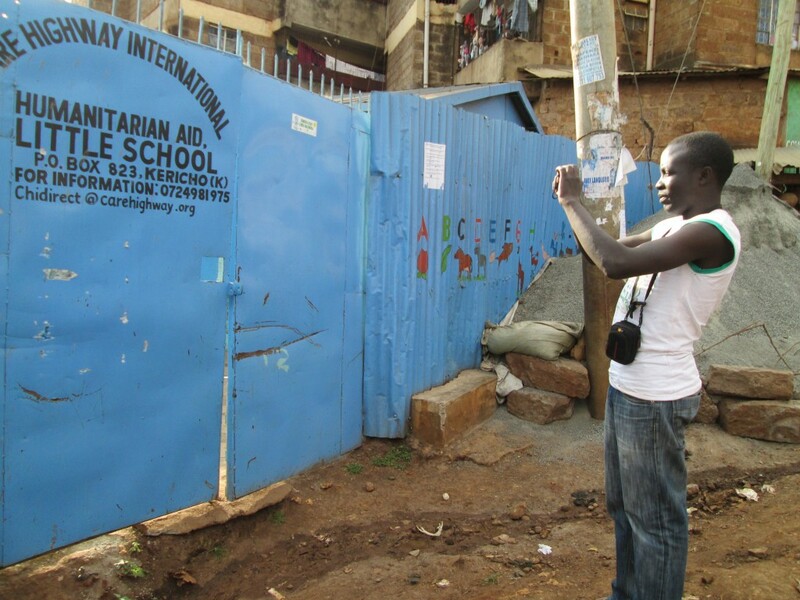 So by me being there documenting the facilities with my camera, I felt that I was indirectly offering a solution to the problems facing school going children in Kibera slums. So, as I switched off the camera, I felt an inner satisfaction that I had done what many people, government officials included, had failed to do to the schools in Kibera, and when we’ll see improvement in education within Kibera as a result of the online education directory, my happiness will be complete. I myself am a parent in Kibera. As a part and parcel of this project, having done the survey as well, I must say this project has already been of great benefit to me. I already know what kinds of schools exist in Kibera, where exactly they are, what programs they offer, and indeed how much they charge, because of this project. In fact I have decided which school my baby class daughter will attend come next year. But it was interesting to see how other parents responded during a gathering we held to introduce them to our project. On Saturday June 7, 2014, the day after the meeting with teachers, we had a similar meeting with a portion of Kibera parents, held at one of the halls of AIC church in Olympic. Parents too came late – lateness for parents was considered even more normal than for teachers. Anyway, the first ten minutes saw a very bored, non-interested parent, yeah, there were some technical hitches, one computer refused to connect to the internet keeping a section of parents waiting. Maybe it was the reason for low mood, but as the presentation continued, their presence could be felt. They started asking important questions and the house turned lively. Different parents have different preferences, and in this meeting parents expressed their interest to have something that could help them make informed choices of which school to take their kids instead of relying mostly on the neighbors, or rumors. Parents wanted information on qualification of teachers, availability of scholarships/sponsors, security of their children, school fees, special programs, e.g. many parents prefer a school with feeding program. Parents also are keen on which faith a school is affiliated to, that is whether Muslim or Christian. But many Kibera parents do not have an access to the Internet, so how would they get the information? They suggested that the information could be made available to them through printed booklets, SMS, Newsletters, Radio, or printed maps. They also preferred that we find a way to disseminate the data through public “Barazas” and parent meetings at schools. Parents want all the relevant information including fees published online, something that some teachers were not so comfortable about. Teachers were worried that it would be too easy for the public including “bad people” to just calculate what amount of money a school gets monthly or yearly, if the fee verses the population is put public. They feared that this would trigger attacks at schools since most of the parents pay cash. Parents on the other hand want to know how much schools charge versus how populated they are. Many parents would avoid overpopulated schools. Parents also were so brave to declare that they will not be worried to have their names attached to a comment on the website for fear of victimization. “In fact that one should be encouraged so that schools can be criticized for a positive change,” says Mr. Nyamweya Ngare, a parent at Olympic Primary School. “It will also increase the level of transparency,” he added. From these two important forums, the questions, the comments, the points, the concerns and the ideas contributed, helped us get a clear direction on what kind of information to go for. Wednesday the following week we were set to roll, taking pictures and asking questions at every school in the field. In April 2014, my colleague Steve and I conducted a pre- project survey in Kibera, talking to parents, teachers and school heads. 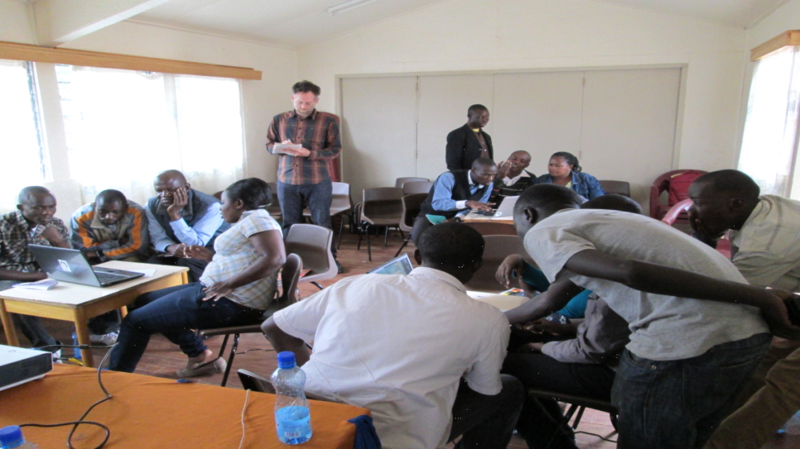 This was meant to find out the missing gaps on education information, and what their thoughts were on Map Kibera Trust, GroundTruth and other partners trying to make education information easily available, accessible and useful to everybody. This was important to know before the actual project could kick off. Kibera people know exactly what they want, and no one can impose anything on them against their will. There is something that anybody who wants to do any project not only in Kibera but also other informal settlements must always observe: that you must involve the people, I mean the stakeholders at a really early stage. If you want your project to succeed, let it be a people-driven idea. One of the Map Kibera founders, Mr. Mikel Maron, was travelling to Nairobi in June 2014, and there was a need for him to meet and engage with all the relevant stakeholders and authorities. I was to arrange and schedule for all these meetings, and so the planning began. 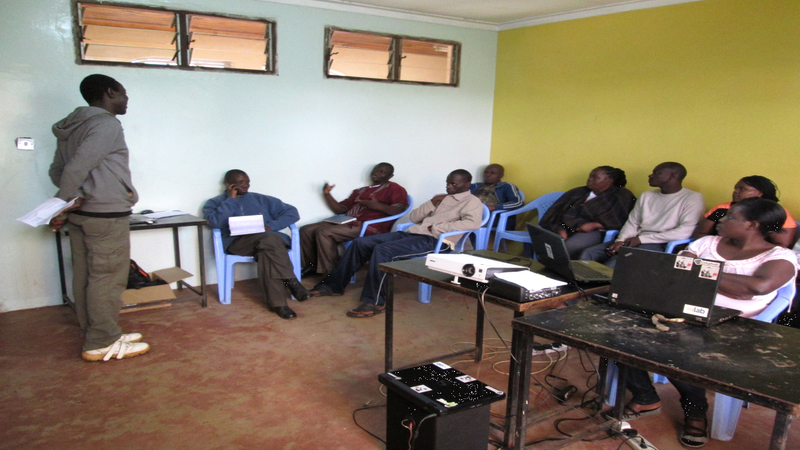 We began by meeting the Chief, the Assistant County Commissioner, and the Langata District Education Officer (DEO). The reason was to explain to them what our education project was all about, and what exactly we intended to do in the process and how it would be helpful to the community, as well as to seek for their support/approval/permission. This was also a sign of respect to them, by informing them prior about what was to happen in their localities. The approvals and interest shown by the authorities really gave us more courage and confidence to proceed with the project. This was immediately followed by the stakeholder’s forum for School Heads and teachers, whose contacts we had gathered during the pre-survey interviews. We held our first meeting on June 6 inside the famous Mchanganyiko hall. Out of the 15 teachers and school heads we invited 10 of them turned up. The criteria to select the 15 was tricky, but all we wanted was to have at least every village of Kibera represented plus a few extra that had raised concerns during the pre-survey exercise. According to the responsibilities delegated to the six Map Kibera team members that were present, Zack Wambua was at the door to take care of the registration, Douglas Namale was taking the notes, Maurine Owino was to introduce the project and present the website, Steve Banner was behind the camera to document the forum, I was to pick up from Maurine and lead the feedback session while Mikel was on standby to oversee and tackle any hard question that could arise from the audience. As usual here, people arrived one hour late after the scheduled time. I could see my friend from Washington DC (Mikel) was not comfortable as he had another meeting to attend after this, but what could he do? This is Kibera, this is Nairobi, this is Kenya, and this is Africa, we’ve been meant to believe that lateness is a culture here. Do not ask me who said, because I don’t know. So what were some of the concerns as far as the whole project was concerned? School heads wanted Map Kibera to consider the governance capacity of schools to handle feedback, or have a team that will keep monitoring the sites. There was a general agreement that constructive feedback can help schools to run better but schools are sensitive, some information can lead to loss of students/teachers or cause closure, leaving schools vulnerable to troublesome individuals. Teachers also argued that freely commenting on the school website can just lead to junk and that it needed some editorial — they thought schools should have the right to verify information. Some people could use the platform to tarnish a school’s name when for instance they have a personal grudge with the Director of that particular school. “What are ways of addressing ethical issues on the site? What are the official channels?” one teacher asked. However, the information is out there anyway – in social media, word of mouth, etc. This platform gives an opportunity to address it. Though we all agreed that there was a need for investigation process on serious cases in order to remain factual. Generally, teachers were positive about the online educational directory. They saw it as a big opportunity on awareness of what is happening at other schools, and they felt that typing on the site would enable them to market or advertise themselves or perhaps use the website to fundraise for their schools, and also for parents to make informed choices. Teachers also emphasized that there was a need to have more information on the particular curriculum followed at each school, performance and test results, extracurricular activities, special needs programs offered, and the school governance structure. “A good project, just a few adjustments here and there and we are good, it will help,” one teacher whispered to his colleague on their way out. 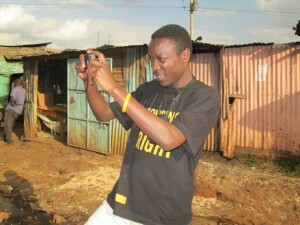 You are currently browsing entries tagged with Grand Challenges at Map Kibera.